An Evergreen landmark, this historic home has been carefully rebuilt twice to maintain its special charm. Original summer cabin burned in the '40s, leaving only its grand moss rock fireplace, prompting the development of the Evergreen fire dept. In the same family since 1953, the home has been lovingly & meticulously cared for. 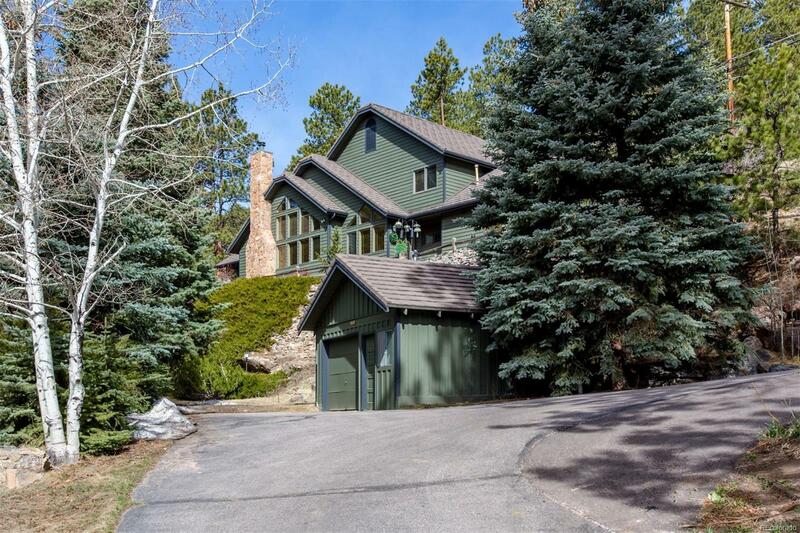 Hand-built native rock walls & a curving drive lead to the sunny private hillside location with views of Mt. Evans & the sounds of Upper Bear creek. Open great room fl.pl. has main level living, vaulted ceilings, sunrm with built-ins, updated stainless kitchen with Sub-Zero refrig. & new Jenn-Air gas range & microwave + walk-in pantry. Big master has new carpet, walk-in closet & remodeled travertine 5-piece bath with frameless shower door. Open sky-lit loft + 2 bedrms with full bath are upstairs. Basement offers cabinets & shelving, updated laminate flooring+ flex room for exercise, play room or office. Whole house generator, sprinkler, ext. stained in 2018.